I first heard about Bitcoin back in 2011 and spent some time reading about it. I found it interesting but never considered investing in it. Again in 2013 I had a discussion with a friend about doing something related to Cryptocurrencies. We did some preliminary research and then dropped the idea as the regulations were not clear in India about cryptocurrencies. I did think of investing some amount in Bitcoin but was not very comfortable with all the money being tied to a Private Key which I could end up misplacing somewhere. I had not heard of any Bitcoin exchanges back then and so I let go off my chance to get into Bitcoin Bandwagon when the price of Bitcoin was around 100 USD. I finally invested in Bitcoin in June 2017. One of the first learnings you have when entering cryptocurrency markets is that Bitcoin is just the tip of the iceberg there are many alt-coins. You do some research and realise there are different Exchanges and you will need to have accounts in these different exchanges to trade different alt coins. So you create accounts in different exchanges only to realise that you cannot transfer your Bitcoin/Ether to ICOs for you to get new coins that are not yet traded on any exchanges. So in a short span of time you end up with accounts in 10+exchanges, an offline wallet for Bitcoin and an offline wallet for Ether. And if you prefer to keep your alt-coins in offline wallets then you will have one many more offline wallets. Very soon you will realise that keeping track of all your cryptocurrency investments is not an easy job and it cannot be done by making entries in your spreadsheet. I hit a similar roadblock around 2 months ago. I did some google searches and read up on various cryptocurrency portfolios. After some digging up I came across Cointracking. I spent some time digging around their portfolio web app and I was convinced that this portfolio should be sufficient for the next two years. Since there was a limit of 200 trades on the free account I went ahead and bought the one year membership. I have found a couple of features that I use frequently and helps me sleep better that I have a handle on all my cryptocurrency investments. If you are too lazy to read further watch the video to get a gist of what I am saying. 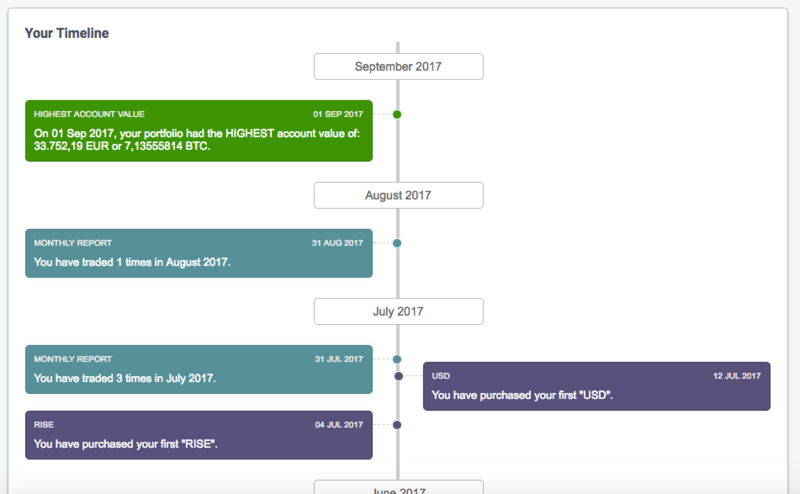 If you watched the video and you are already convinced that you should start using the portfolio tracker use this referral link Cointracking to get a 10% discount. If you use Bitcoin to buy you will get an additional 5% discount. That is another thing I liked about Cointracking. Everybody who is building businesses using cryptocurrencies or around cryptocurrencies should follow this approach to promote their adoption. The first step to track your portfolio is to make sure that all the purchases, withdrawals and trades are exported from any exchange/wallet you use are imported into Cointracking App. 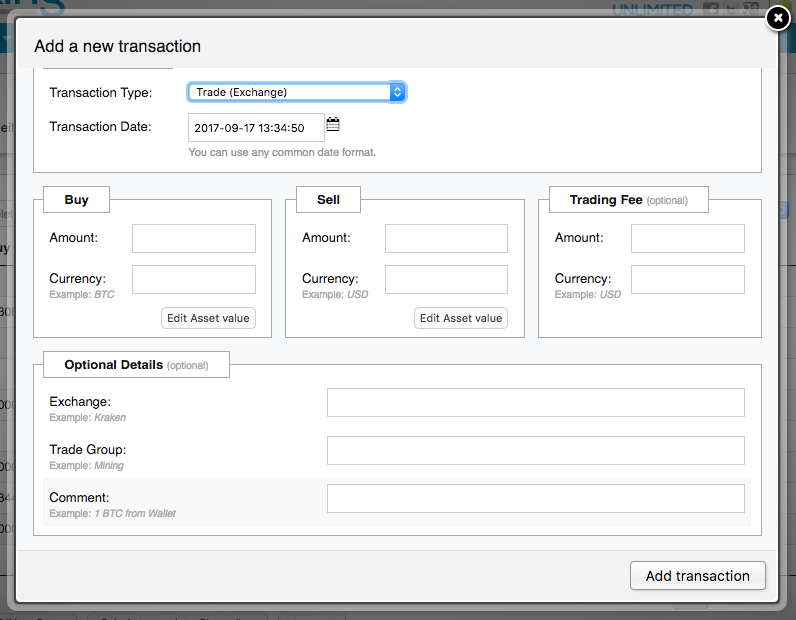 This can be done in three ways Enter manually, Import from Exchanges or automatically via the API if your exchange supports it. I had to use a combination of all these three to keep my portfolio upto date. I have ordered Ledger Nano and will need to check how to sync with it once it arrives. Make sure to enter all the relevant details. Remember to enter all the optional data as well as it can save you when you are trying to delete the trades or edit them. Trade Group helps your group one kind of trades and give details comments to remember later why you had to do a manual entry. Follow this diligently and you will thank me later. In my case CEX didn't have an API and hence I had to go with exchange import option. Cointracking does a cool job of letting you know what kind of transactions are supported by the export provided by the exchanges. Keep an eye on this. Some exchanges doesn't provide you details about deposits and withdrawals. This can have an effect on your summaries. You might need to keep track of those and create manual entries for those to keep your Dashboard upto date. You need not worry about the duplicate imports as each trade has a unique tradeId and based on it Coin tracking will import only the new trades. 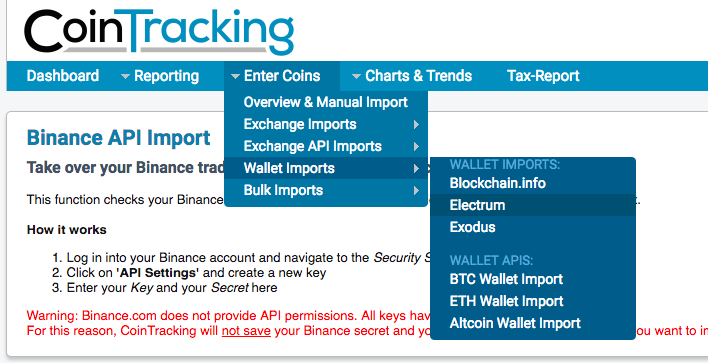 Cointracking gives you the details of the supported actions in the API import. Be careful if you are using the API for syncing your trades. I would suggest enabling the APIs in the exchanges only after enabling the Two Factor Authentication(2FA) and make sure that you only enable the read access in the API. When I was trying to enable the API for Binance I realised that they have all or none access. So your API will either have both Read and Trade access or none. When I saw the API integration screen of Binance I could see the bold read warning message from Cointracking saying that they do not save the API secret key as it has trading access as well. This was good sign for me and my confidence in Cointracking increased after this incident. It is still foolish that Binance doesn't have access restrictions on their API. I have never been comfortable with Offline wallets as I fear that I will miss my private keys :P I have always held back on creating one as there is no way to regain the stash if you loose your private keys. But I had to create one for ether as I wanted to participate in a couple of ICOs. As you can see from the pic Cointracking has support for Electrum and Exodus imports. I hope going forward they will add support for more wallets. It also has support for monitoring your Bitcoin, Altcoin and Eth addresses meaning it can track the transfers from wallets and it also has a nifty feature of sending out a notification to you when a transaction happens from your wallet. I think that is very handy. Once you have all the integrations set up and imports done you should have dashboard which gives you a overall idea of your portfolio and current holdings. Timeline is one that caught my attention. It gives you a nice grahical view of important milestones in your journey and gives you a feeling of dejavu. There are various reports provided by Cointracking. I majorly use the following reports. Use this report to make sure that all your trades are present. Whenever I do a trade I check the next day to make sure that it is there. I am more of a HODLer and hence it is not a problem. This gives you a quick idea of how your stash is distributed across the exchanges. When something is amiss or transactions seem to be missing, this view can give you a quick idea about which trades are missing. If you have bought a stash of a particular coin at low price and have been selling them at every high, it becomes very difficult for you to identify what are you profits over the time. Also at times you will feel like knowing the answer to the question "If I sell the remaining part of my stash will I make a profit, loss or break even". If you have been in that situation before then the Realised and Unrealised Gains report can give you very good insights. Similarly if you have bought at different prices to average out then this report can give you the average purchase price of a coin. Yes you will need to pay your taxes on Cryptocurrencies gains. I am not sure if many are thinking about this right now but this can be a Herculean task. Looks like Cointracking has you covered here as well. With ability to configure various parameters for your tax reports I think this can come handy. If you are planning to use this portfolio manager use this referral link Cointracking to get a 10% discount and don't miss out on the additional 5% discount if you use Bitcoin for payments. If you have come across any other portfolio manager do let me know so that I can take a dig at it.